Surfing at Cardigan Bay Active01239 612133work SurfingLearn to surf at one of our local blue flag beaches with trained and experienced instructors. West Wales has some of the most consistent beach breaks in the country, so join us for an introduction to wave riding. We’ll take you through the basics on dry land first and your instructor will be on hand throughout to provide tips and encouragement to get you riding waves confidently. 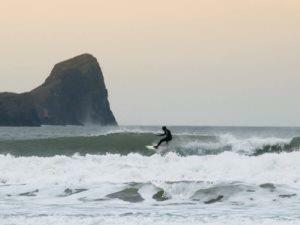 West Wales has some of the country’s best and most consistent surf, with breaks at all ends of the region. Our Surf sessions are designed to give you an introduction to the activity with an experienced instructor. You don’t need any experience, just loads of enthusiasm! Your lesson fee includes hire of the board, leash and wetsuit and instruction from a trained coach. By breaking each part of the skill down, our staff pride themselves in being able to get most people standing by the end of their first lesson—but be warned, it’s hard work! Learn to surf at one of our local blue flag beaches with trained and experienced instructors. As well as learning how to stand up on waves, you will be given vital advice in beach safety (spotting rip currents, tides) and surf etiquette.